Let's get right down to it: the only reason I gave this race an overall score of 4 instead of 5 was because of the time management. The race was scheduled to begin at 9am, but around 8:50 an announcement was made that they were still allowing walk up registration, so they would be delaying the start of the race. 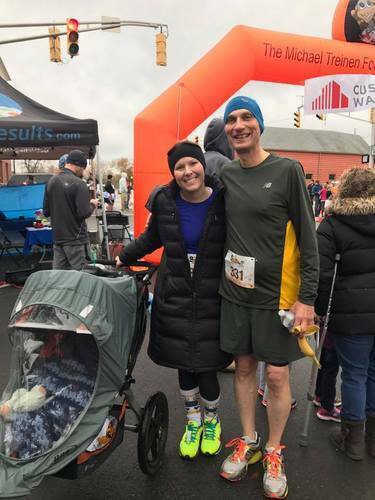 The race ended up beginning about 15 minutes late, and while it wasn't a HUGE deal, it wasn't ideal either since it's cold outside in Indiana in November and I was racing with my one year old (who doesn't understand patience quiet yet!). It's a chip timed race, so our group and the folks around us were all talking about how they should just start the race and let those folks start a few minutes later. Aside from the delayed start, this race was great! It's easily accessible with plenty of parking around the Noblesville town square and surrounding parking lots, the course gives you a nice view of the city and Forest Park, and there's a bit of elevation change throughout so it's not just a flat, boring race. I really enjoy that this race draws such a variety of people each year - from the local cross country teams to families with their kids and dogs to groups that are just out to support the cause. It's a great event if you're just a casual walker or runner who wants to bring their family out. There are no aid stations on course (had to provide a rating above, hence the five stars), and no metals distributed, but the shirts are nice, long sleeve tech shirts each year (this was our second year participating). Prior to beginning the race, they do a balloon release in honor of those who have battled cancer. Balloons can be purchased at a tent on the town square for $1 each. 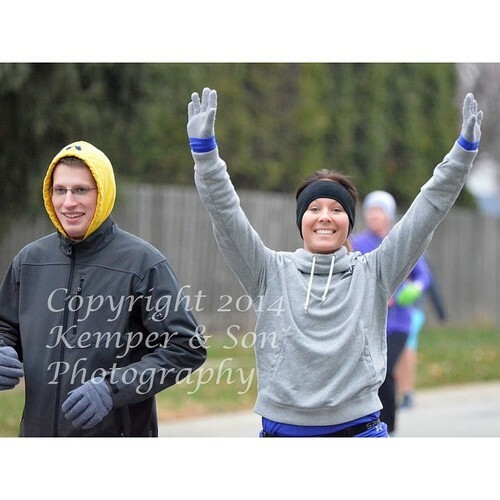 $30 entry fee, great turkey trot if you're local to Noblesville. I recommend it! "Is the Caribbean this cold?" SWAG: If you like swag, this is a great race for you. With your entry, you'll get a hooded sweatshirt (it's very festive!) along with a race medal at the finish line and it has a really fun design! Definitely a great medal to add to your collection if you're looking for variety. AID STATIONS: There was water around the halfway mark on the course, and I was very grateful to the volunteers for standing out in the cold to hand us out cups. At the finish line, Orange Theory had a tent and was offering bottled water. Thinking this was all there was, we left right from that tent. We later learned that there was some other food offerings (I believe fruit and donuts?) available in the gazebo where the earlier race announcements had been made. COURSE SCENERY: I am 100% biased on this section because I love running around Carmel. I've got a lot of great memories from other races in the area, so running on a path that brings back so many memories for me was really, really fun. Even if you aren't someone with memories attached to Carmel, you'll enjoy this course. ELEVATION DIFFICULTY: It's Carmel, there are some "hills." They're pretty subtle as long as you've previously trained on hills. PARKING/ACCESS: Very easy to find parking near the start/finish area. We parked in the Police Office parking lot, and it was a minute walk over to the start and finish. No big deal! There was plenty of parking in the surrounding area, so I wouldn't worry about parking even if you chose to come closer to start time. RACE MANAGEMENT: Race management was meh in my opinion. While we got details about where to park, when the race would begin, and things of that nature, I felt like the communication overall was lacking. Nobody specified that runners should line up based on pace, so it was really difficult to actually run in the first mile. Another complaint I had about the race management was that we didn't have some critical information like where to find food after. 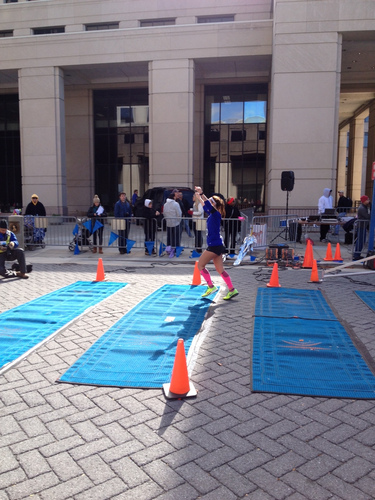 Overall, though, it wasn't the worst race experience I've ever had. There was no EXPO, packet pick up just took place the morning of the race. Overall, this race was okay but not one that I'd do again or recommend. We chose it since it was in Carmel and fell on my birthday, plus I love sweatshirts! The race management's communication and lack of corralling by pace are what would hold me back from doing this race again. Here's the deal - the official race shirts are pretty similar each year, so I had an idea of what to expect; grey and white, with either red or blue to signify which distance you participated in. I ordered a men's shirt, as I typically do at races, and found it to be too big. So my tip to you ladies - even if you normally get the men's shirt, go for the ladies cut! They'll fit, I promise. And they offered an exchange table if your shirt didn't fit, making it easy to switch it out for another shirt. For the medal; this year started a new initiative for the race, where the medal is one of four that will connect to make a design. While the medal was cool, it definitely looks like there's a chunk missing if you aren't aware of the four year plan for these medals. Very nice quality, just a little strange to look at with only one piece! This is my one major gripe about the race - the aid stations from about the half forward were lacking for anyone that was mid-to-back of the pack. By the time I reached the aid station where fruit, candy, and gels were promised (19 or 20, I believe), there were only a few Snickers left. While I was grateful for the treat to change up my fuel (and extra grateful that I had packed my own sugar and fuel! ), I was annoyed that the course would be open for another 2 or so hours, and nobody out there would get those items either. Another issue I had with some of the earlier aid stations was that they were trying to fill water as runners were coming through, so you had to stop and wait to get a drink. While I wasn't racing (just going for a completion in my first full! ), I can see how frustrating that would've been for someone trying to BQ or set a new PR. Volunteers were great and plentiful throughout the race, and they were still cheerful for those of us near the back! Not a complaint from me! The spectators greatly decrease on the full course after you leave the city, but it's still lots of great scenery and there is a lot to see. They also make a point to go past a ton of great Indy landmarks (like the IMA and cemetery), so you won't get bored even if there aren't spectators out! The expo was awesome. There were a ton of great vendors, and even on the second day towards the end of the expo when we went, there was plenty of activity and merchandise left. One of my favorite part was the featured speakers. It was great to hear what they had to say, and having the opportunity to meet Jeff Galloway was fantastic! On the full course, there are some slight inclines and one "bigger" climb. It's certainly a mostly flat course, just beware that you do climb a bit here and there. Easy! They offer prepaid parking options through the race website, or you can take your chances at parking in downtown Indy. Either way, easy to find a spot if you get there early! Outside of my aid station complaints, I don't have any real problems with the management on this race. It's clear they know how to put on a great event, manage it well, and make sure it's enjoyable for all the runners. Overall, I would do this race again - with one stipulation, and that's a date change! The weather for us was a feels like temperature in the teens and winds at 20mph coming from the North (meaning for the full, you ran into the wind for the first 14 or so miles). Indiana weather is unpredictable, and next year the race will be a full week later (on November 7th). Because of that, I'll likely skip this race and go for something that has a better chance at being a bit warmer. Never say never, though! YOU MUST DO THIS RACE, PERIOD. It's AMAZING! So well managed, full of fun delights (CHOCOLATE! ), and you get great swag. If the price is making you wonder if it's worth it, I can promise you that it is! SWAG - With your entry, you gain the chocolate (!!!) and a participant sweatshirt that's super cozy. If you choose to do the 15k route, you'll also earn a medal (remember, it looks like chocolate but you can't actually eat it!). 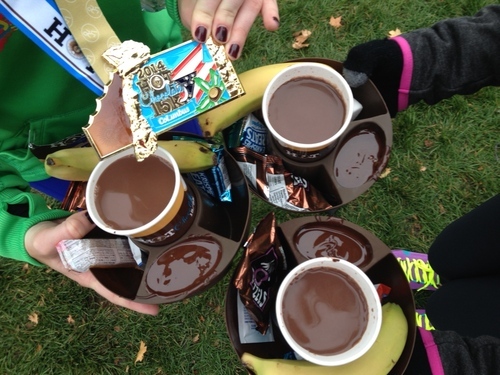 At the finish line, you get a mug filled with things to dip in your chocolate fondue along with a cup of hot chocolate; much needed after a snowy race! AID STATIONS - On the 5k course, you get two aid stations; one is giant chocolate chips, the other offers water and Gatorade. For a 5k, it's the perfect amount of aid. That said, I was a little sad that the 15k course had so many more chocolate stops! COURSE SCENERY - I'm not from Columbus, but I enjoyed the scenery and from everything I heard, it was a great course! ELEVATION - Going right along with the scenery, the elevation profile is relatively "easy." It's a little hilly, but nothing that your legs can't handle whether you're a fan of hills or not. They pass relatively quickly and make the course go by much faster with the changes in elevation. PARKING - Super easy. We arrived about an hour early to park since that's what race management suggested, and we didn't have any issues parking. We parked in a garage that was right by the finish line area, so it was quick for us to get to and from the race. It was also super nice because race management had a TON of restrooms available and one of them was located right outside the garage. RACE MANAGEMENT - 100% amazing. There was constant contact in the days leading up to the race and the management on course was just as well organized. The corral system was very helpful to make sure everyone was in the correct place based on their pace, and the organizers did a great job of entertaining everyone until their corral started. No complaints here. I'll absolutely do this race again, it was a great experience and offered a ton! Love, love, love this race. I don't have any cons to share, so let's get right down to all the reasons that the Wishbone 5k should be your turkey trot of choice in 2015! + The race management is fantastic, sent several emails with directions, and made the entire race experience one that I would do over and over again. + We chose not to pick up our packets the night before, which was totally fine. We got to the Fishers YMCA around 7am (for an 8am start) and had no problems getting our bibs! + Another perk: you get to wait inside until right before the race starts! Nice and warm! + I think this was part race management and part runners on the course: people actually lined up based on their anticipated pace! That meant there was no bob and weave happening, which was amazing. 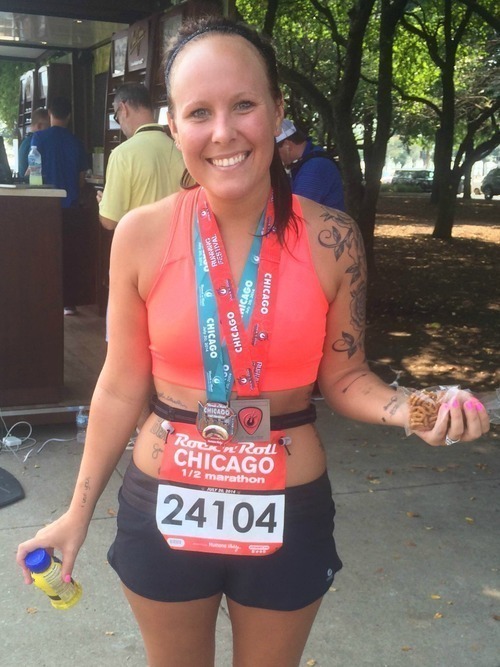 + This race is family, stroller, and pet friendly! + The course has a couple "hills", many of them occur in the first mile (which is a long, straight shot) and then it flattens out. + There is one water stop offered on the course and they give you a big glass of water (about double what you would expect on a course). + At the finish line, they offer a banana and water bottles. The finish line is right across the street from the start line and they had police officers out at the crosswalk assisting finishers cross the street without playing chicken in traffic. + Parking was easy and plentiful! + The shirts were long sleeve tech shirts, and they had a great design on them. No medal, but the shirts were amazing! This is a "smaller" turkey trot in the Indianapolis area with only 700 or so participants. That was one of the many reasons that my family and I decided to run it instead of one of the bigger races where it would be more crowded / more difficult to park and etc. I would highly recommend this race! Your entry benefits the Fishers YMCA, it's managed well, and it's a fun time!